It’s the little things that can add up to bigger bank. NEA Member Benefits proudly serves the National Education Association’s 3 million members, who are dedicated to their students, their students’ families and their communities. Through best-in-class programs and services, NEA Member Benefits strives to make members’ lives better, adding value to their membership and enriching all aspects of their personal and professional lives. Visit neamb.com to learn more. 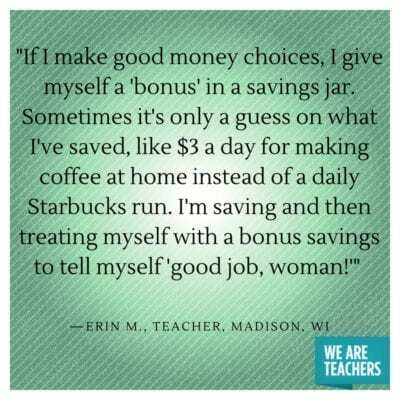 Every little bit of savings in the teacher piggy bank counts, this we know to be true. So how do you really start saving money week to week? 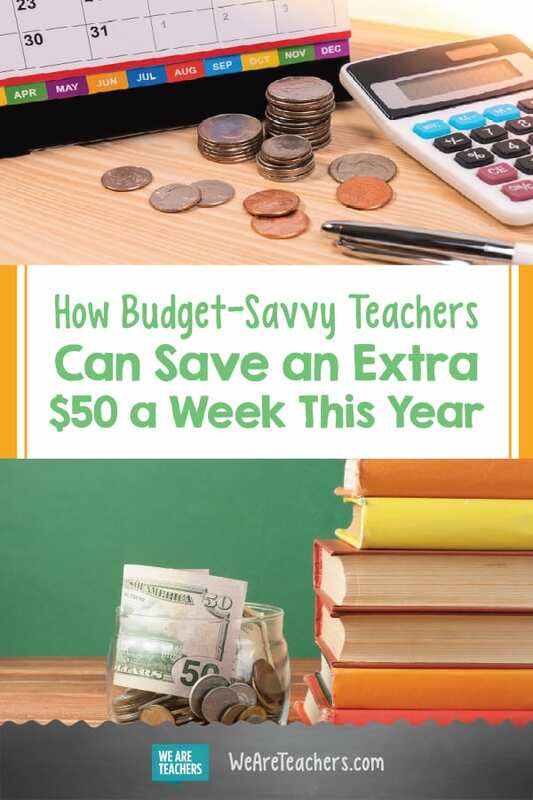 We asked our Teacher Helpline, money experts, and WeAreTeachers staff for their favorite savings strategies. 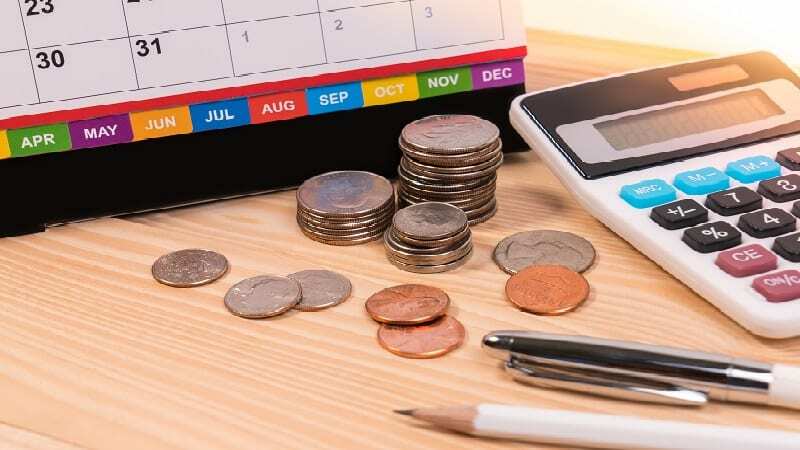 From the fix-it-and-forget-it approach to some fun ways that just make life easier, put these savings tips in your school bag and use ’em! We’d love to hear your ideas too. Make your phone plan work for you. Haggle your phone and cable bills. Practice those negotiating skills for optimal teacher savings! Before calling your provider, know the best local rates and use them as a starting point. If they don’t budge, ask to speak to the cancellation department. According to Money magazine, people there have more wiggle room to offer a lower rate, and they want to retain you as a customer. 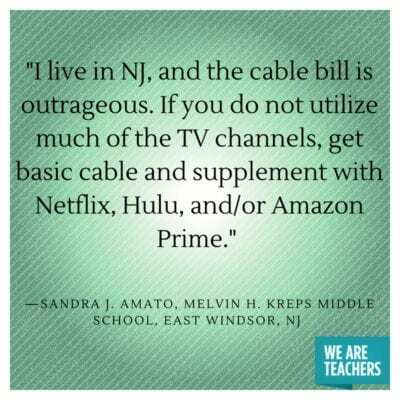 Many teachers get extra savvy with their bill or cut the cord altogether when it comes to their entertainment subscription services. 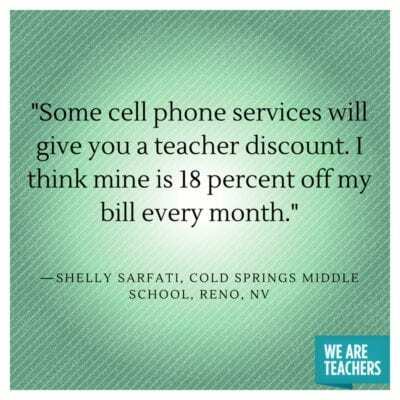 Keep an eye out for teacher-specific deals too like NEA Member Benefits’ discount on AT&T Wireless. Examine your cable viewing habits to make smarter choices on spending and saving. Maybe you watch different or fewer channels than when you first signed up. Figure out habits and look into great lower-cost alternatives to cable. Keep an eye on your subscription services. Your monthly subscriptions might save you money (like if you’ve cut cable), but management is key. Find a service that keeps tabs on where your money is going. 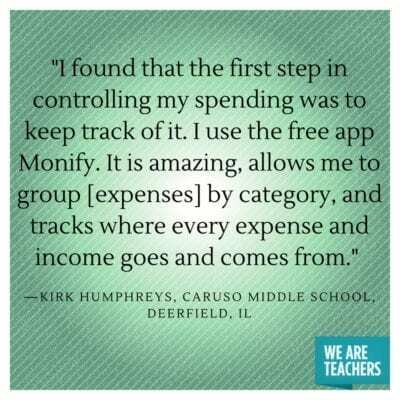 Every subscription adds up, and some teachers might be surprised to learn they are still subscribed to certain services. An app called Trim helps analyze your transaction history for recurring payments and texts you what’s happening. It will cancel any subscription you don’t really want to keep. This is really helpful for those seven-day-free-trial deals that may have slipped your mind. If you buy it, track it. Learn your spending habits and where you can cut small costs. It’s both empowering and gets your savings on the right track. Consider an online budget and expense tracker, or print this free workbook that includes budget worksheets, weekly and monthly expense trackers, a debt pay-off tracker and more! Double your savings with a Treat Yourself jar for every smart money move you make. Make your savings strategies a game. Here’s a fun way to watch small savings add up: At the end of the day, put all your singles in a jar. Or, you could do this with $5 if you’re ready for a bigger bump. Mix it up! Up the ante each day of the week ($1 Mondays, $2 Tuesdays, $3 Wednesdays, etc. )—whatever you can manage. Randomize it and pick a dollar amount to save. Credit cards can help you earn rewards like cash back that you can put toward other things. 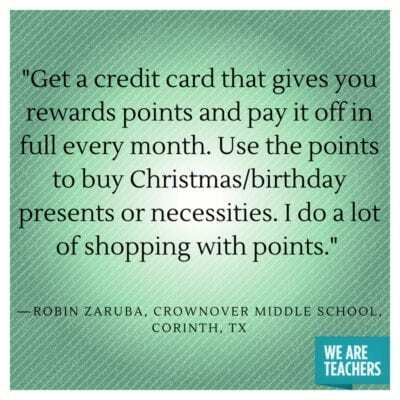 Lots of teachers have mastered the credit card game—while paying off their bill each month—in terms of rewards programs. Watch for special deals from particular stores or on certain types of purchases for real rewards and savings. See if an NEA Member Benefits has a credit card that’s right for you. One teacher’s trash is another person’s treasure. Sell your unwanted items and pocket the cash! Clearing out clutter feels so good. Make it a monthly habit. Whether it’s eBay, Craigslist, Facebook Marketplace, or your neighborhood yard sale, there’s clutter to cast off and cash to be had! There are countless ways online and at big-box retailers to make the process seamless, whether it’s a straight sell or trade-in. Amazon, Best Buy, and more options to trade in phones, DVDs, and other electronics for gift cards or cash redemption. You schedule your bills, so schedule your savings like you owe someone and need to pay them. Use a bill-reminder feature on a budgeting app or similar software. You owe it … to yourself! Reach your goals faster with these additional tips on being a strategic saver. Cut off paths to easy spending. Think of all the times you’ve loaded up your online shopping cart. It was just way too easy to pay since your credit card information was already attached to your account, right? Try asking yourself, “Is this really worth it?” If it’s not, don’t buy it. Boom, more money saved. When you do shop online, save like a genius. Deal-of-the-day programs, like Groupon or Living Social, are great. 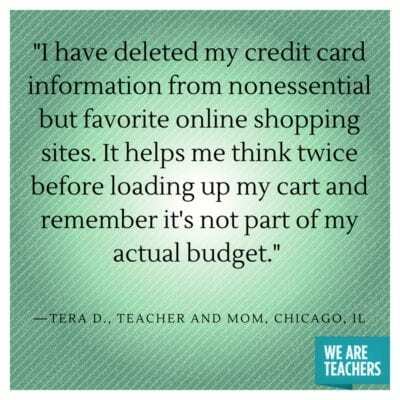 Maximize your teacher savings with the NEA Click & Save discount shopping portal. You can find big savings on your favorite retailers, entertainment tickets, restaurants and more. What are the smart and small ways that help you save each week or month? 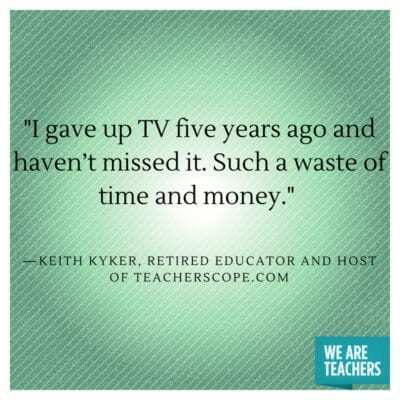 We’d love to hear about it in our WeAreTeachers HELPLINE group on Facebook.